Its all by the infinite grace of the Master, Mother and Swamiji that this blog has had more than 134,600 hits in such a short time. The very first Post appeared on 23rd January, 2008. Now this blog contains 122 Posts and 11 Pages with 1468 Comments. Though it has become highly popular among the devotees of the Holy Trio, yet I do find a lot of people from other faiths too frequent this blog. Many a reader prefer engaging in conversation by email rather than public commenting. Well, every one is welcome! This is the famous Sri Jagaddhatri stotram in easily recitable twelve verses. Today is the auspicious devi navami tithi when Sri Jagaddhatri, the Magnanimous Mother’s puja is performed among the devotees of Devi worshippers. Hardly I knew about this puja before I was posted to Ranchi Sanatorium centre in 1995. The Puja was an unforgettable experience as I had, year after year for long 12 years, the blessed opportunity to witness it and hence I remember today as devotion swells in my heart. The full details how this wonderful worship of Ma Jagaddhatri “mela” is performed can be seen here. Last year, one devotee Kiran from Nottingham, UK read a post in this blog on the worship of Mother Jagaddhatri. 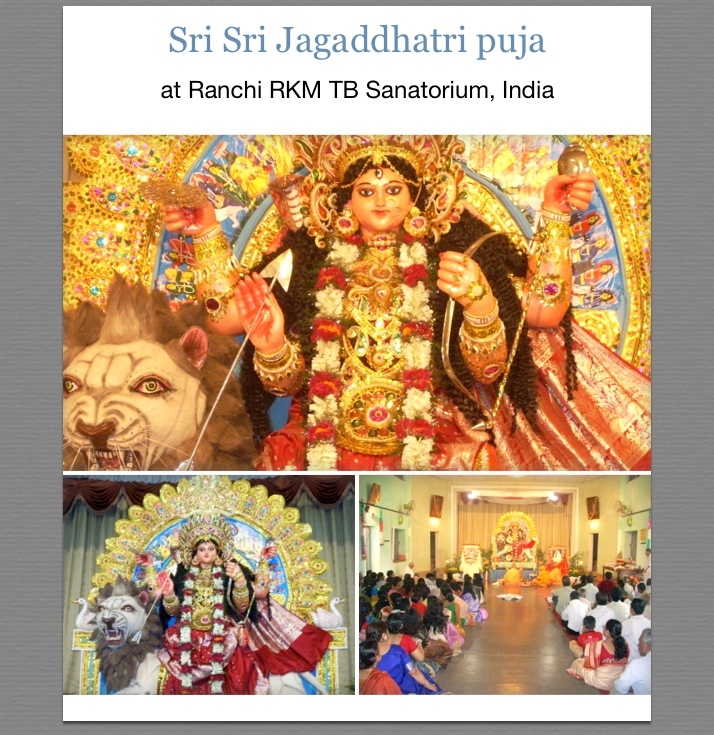 It seemed that she was very inspired to read the account of how this puja started at Joyrambati. She then requested publishing of this hymn. I am aware that many of our SA devotees who are not familiar with Sanskrit lipi (script) may find it difficult to read. Thats why I have added the English transliteration. Previous Post: De’light’ful Diwali ! Last year, I was lucky enough to be at the Sri Sarada Math in Dakshineshwar for Maa Jagaddhatri’s pooja and this year, I have your English transliteration. Perfect. It proves that Mother is doing every thing! May the grace of God be on you all is my prayer! Many thanks for this blog! Maharaj is so much more accessible to readers even those from the most obscure parts of the world. Often, when I have exhausted reading all posts, comments, etc., I look at the live feed and am amazed at how Master’s influence is working through Maharaj. Thanks for your keen interest in observing the accompanying widgets and what they signify! Generally when the link is received by any reader, s/he just flips the page and reads quickly to find out anything of interest is there or not. Well, this is the first time that I hear from someone talking about the side-column widgets! And we must reassure our minds that Master does His own work in His inimitable and inscrutable ways! Many a reader have vouchsafed to me that they had no idea about the existence of this blog and somehow unknowingly ‘landed’ at this site by some queer connection! Thank You Maharaj ji, so much for sharing the Jagaddhatri Stotram with us. May the Divine Mother bless You always! May our holy Trio: Master, Mother and Swamiji bless You always! Indeed the ‘stotram‘ is a valuable addition to our hymnal literature. How much they help us in our trials in remembering God cannot be overstated. I have personally seen the singular effect of ‘constant remembrance’ when physical work like cleaning the shrine etc was being done and the mind, goes on chanting any hymn. Thanks to our sages who composed these wonderful stotrams in such perfect meter that we enjoy the music also to this day! This is indeed by grace of Holy Trio, auspicious news on this auspicious occasion. This blog has definitely crossed many boundaries. I recall how a Swami from Moscow was saying that he was a regular reader. It is also a very powerful and inspirational resource for youth. Thank you Maharaj for this gracious darshan. Many thanks for your appreciative words! I am indeed indebted to that Moscow Swami. There are many a monk telling me that they find this blog interesting and useful too. Of course as a general rule a few only send in their comments. When I do occasionally post-mortem of the statistics, I am amazed at the readership range. Here is a list of countries showing how many readers have ‘hit’ this blog! There are some obscure countries the names of which were not known to me until I saw the Statistics! This morning, I was narrating the story of Jagaddhatri Ma as explained by you earlier. When I was thinking about how I came to know about it, your new address and Jagaddhatri stotram come to me as a blessing! Glad that the stotram came handy to your day’s spiritual pursuit. We are here at the moment at the puja in the Math. We have met your dear sister Barbara. The Amith and the girls are well. What a strange name you have, I say!! Well, I can understand that you don’t want to be obvious. It doesn’t matter. Thanks for giving me the news about Amiths and the girls and Sister Barbara who is well-known to Ramakrishna circles as Kalyani. She has been a great devotee, motivating people in USA to donate for the noble causes in India. She is ably running an institution called ASTI that channels foriegn donation for many good purposes in India. Its a great service. When I was in Ranchi Sanatorium, she had attended Jagaddhatri puja, fully dressed up like an Indian lady with dot, saree etc.! And the tribals just loved her! Hope brother Y is taking care of you all. This is to let you know that a family of devotees from South Africa, two tiny girls and a lovely mother had tea with me. We discussed you as I asked about you and then came to my room and opened this posting. I asked her to post a comment. We are staying at Belur Math for Jagaddhatri Puja and of course your name came up after tea. I was relaying the fond memories created when we used to travel in “gangs” to Ranchi to enjoy the Puja. Our world is getting smaller and our family is getting larger. Here’s one reason. I came to my room to check email and saw this blog. Congratulations on the meaningful contribution to Ramakrishna’s work in South Africa. All with Mother’s blessings. Remember the immersion? and I was dancing with the local ladies and my hostess said the Bengali ladies don’t dance!! Glad that you are enjoying the company of a family of devotees from SA. Oh Barbara! those were the days extremely enjoyable during Jagaddhatri puja! I still remember the ‘gangs’ as you put it, how wonderful these people, coming from different parts of India as well outside, thoroughly dedicated to the Mother’s work! And every thing went off smoothly; such a team work is indeed rare! The tribals of course have a natural bent towards music and dance and with gay abandon the men and women would dance to the rhythmic drum beats as the Image of the Mother being taken for immersion in our Dam. I remember how the tribal ladies drew you to their midst and made you dance, well, it was just hilarious affair which every one in all its innocence enjoyed! The blog is always inspiring & channels tremendous knowledge to us. We are ever grateful to Maharaj for his divine work. Thank you for the beautiful Jagaddhatri Stotram. I am thankful for your nicer words! Glad that you enjoyed repeating the stotram! As you might have noticed that after becoming a Paid blogger, it is now possible to place audio and video clips too in this blog! All improvements are in His service. Thank you for the lovely Jagaddahatri Stotram. It is wonderful with the audio. Your blog is our constant link to South Africa, and by reading your posts, it feels that we are part of the celebrations in South Africa that we have been accustomed to all our lives. I am indeed glad to hear from you, Umesh! And also to know that this blog is serving as a link to your own country. Yes, many a devotee who have gone out really miss the “Ramakrishna ‘eco-system'”! The once a week regular satsang, the definite satsang pattern, the functions and attending in absolute ‘dress code’ and of course be with one’s relatives, friends and above all the holy company of Swamis and Didi – all cannot be perhaps duplicated anywhere. Thats why my writing style has become more so descriptive to evoke the imagination of the readers, making them feel they are in the event! I am further glad that you enjoy it. Hope this occassion of Jagaddhatri Puja finds Maharaj well. Thanks for the Beautiful Stotram! Last night as I was reading about how Holy Mother initiated this Puja at Joyrambati, how I wished that we could do this worship here, and I also wished that a stotram (althought one could read from any part of the Candi) was available to offer and glorify Mother! And today Mother sent it via Her child, such is the Mother’s Grace! Thanks Maharaj! Well, you are indeed blessed to have such a grace instantaneously! Though all of us are aware that the grace has been always there, you, being a sincere devotee, has come to know when to ‘unfurl the flag’ and allow the breeze to ‘take the boat’ in the flowing waters. Self-effort and grace are ideally matched! Thanks for the beautiful Jagaddhartri stotram. Your blog is extremely inspiring and every time we are gaining some knowledge from it. I am glad to know its successful journey. All the success of this blog is indisputably through the grace of our Holy Trio and immensely contributed by the devotees like you who avidly not only reads but also proffers comments. I have personally heard from many devotees as well as monastic brothers – who relish going through the various comments and their responses – that they joyfully consider this reading as part of eSadhana! It is with great joy I am writing to you as my mind is filled with bliss after attending three days of sacred Jagaddhatri Puja at holy Joyrambati. I have just returned from holy Kamarpukur-Joyrambati, after spending blessed four days and three nights there. I went there on 21st November morning and returned to Kolkata on 25th November evening and I stayed at guest house of holy Kamarpukur Dham. 1. On 21st November, I reached Kamarpukur Dham – there I partook afternoon prasad, witnessed holy Sandhya Arati of Sri Sri Thakur and then listened to scripture-reading ( a chapter from “Sri M Darshan” was being read there) in the sacrosanct shrine there. 2. Next day on 22nd November, I witnessed holy Mangal Arati of Sri Sri Thakur at Kamarpukur Shrine. 3. Thereafter I left for Sri Sri Matri Mandir, Joyrambati: I paid my homage to Sri Sri Maa at the revered Shrine there. Thereafter I sat down in the lovely mandap of holy Mother Jagaddhatri. This mandap had been erected on the lawns of Sri Sri Matri Mandir. The whole mandap was redolent with charming fragrance of “dhoop and dhuna”. 4. The image of holy Mother Jagaddhatri at Joyrambati was beautiful beyond words: She was red (;like a red Sun) in colour, bejewelled, armed with “shankha-chakra-dhanur-vaan”, astride on lion that was conquering Karindrasur ( elephant demon). She was surrounded by her companions “Jaya” on her left and “Vijaya” on her right. Rishi Narad was on the right of Vijaya. 5. When I reached there at 7.30 am, Puja had already commenced. First Saptami Puja was performed. “Shorashupachar” Puja (Puja with 16 items) was performed amidst chanting of hymns.The chanting of the sacred hymns was blissful to hear. After Puja ended at 10 am, there was Arati and then all the monks and devotees offered “Pushpanjali” to holy Mother Jagaddhatri. 6. Shortly thereafter, Ashtami Puja started. “Shorashupachar” Puja was performed and stotras were recited. After Puja ended, there were Arati and Pushpanjali by monks and devotees. 7. After a short break, Navami Puja started. “Shorashupachar” Puja was performed and stotras were recited. After Puja ended, Arati was performed and Pushpanjali was offered by monks. 8. Immediately thereafter, curtains were drawn all around and the mandap was closed for offering “Bhoga” to Holy Mother, Jaya, Vijaya, Narad Rishi, Maha Singha and Karindrasur. .
Jai Sri Sri Jagaddhatri Mayee ki Jai”. 11. At 5.20 pm, conch shell sounded three times and then, Sandhya Arati of Sri Sri Maa began inside the main shrine of Joyrambati. All monks and devotees sang the immortal stotra of “Khandana-Bhava…” in unison. 12. At 6.10 pm,conch shell again sounded three times and then Sandhya Arati of Sri Sri Jagaddhatri began inside the mandap. It was fantastic to watch three monks jointly performing the Sandhya Arati, with items as mentioned in point 9 above. The combined sound of different musical instruments “Dhak-Shankha-Kasar-Ghanta” created an out-of-the world atmosphere during the Arati ceremony. 13. Thereafter, I returned to Kamapukur. 14. I again went to Sri Sri Matri Mandir on 23rd and 24th November to witneess additional days of Jagaddhatri Puja , because as per tradition started by Sri Sri Maa, Jagaddhatri Puja is performed for 3 days at Joyrambati. The Puja began at 7.30 am each day and ended by 9.30 am each day. Bhoga Arati and Sandhya Arati were performed on 23rd. 15. On 24th November morning, all our hearts grew heavy with sorrow as “Visarjan Ceremony” began at 9.40 am. The Pujari and Tantradharak circled around the image of Sri Sri Jagaddhatri 3 times amidst chanting of hymns, followed by “Kalash Visarjan”. 16. In this manner, the three-day Jagaddhatri Puja ended. Thereafter, I went to Koalpara Ashram, the “Baithak-khana” (drawing-room) of Sri Sri Maa to offer my homage and then returned to Kolkata on the same day. Your ‘brief’ description of Jagaddhatri puja at Joyrambati containing ’16 paras’ gives such detailed info that merely reading of which transported me to that holy spot and I could experience, through the supplied vivid portrayal, a satisfied sense of being there on that auspicious day! Thank you for this wonderful report! I have no hesitation to say that all other readers who go through your descriptive report would aslo feel the same as mine. May you be blessed in abundance is my earnest prayer! Thakur gave me the opportunity to see the Jagaddhatri puja for two times at Ranchi. Thank you Maharaj for the translation which convey the right meaning of stotra. Yes, Mou, I do remember your two-times visit to Ranchi for Jagaddhatri puja. Glad that you consider your visits as Thakur-given opportunity. Thats the spiritual view one should have with regard to every aspect that happens in our life. As Thakur has put it, “even a leaf will not move without Her Will”. It is absolutely true. May Bhagawan Shri Ramakrishna bless you!